Statistical process control can help identify problems, suggest corrective actions and reduce overall costs while preventing potentially serious issues. To assess pulmonary health, physicians routinely order electrocardiograms (EKG) for their patients. Electrodes are attached to the patient's chest and signals from the heart are "listened to" by a machine. A paper printout plots heart rhythm over time, allowing doctors to identify peaks, valleys and patterns in the heart's electrical impulses. Using the printout, physicians can assess heart health and uncover previously unknown problems. After issues are uncovered, doctors can prescribe medications, suggest corrective actions, and prevent or eliminate potentially serious health issues. Now imagine applying an EKG to a company's most critical manufacturing processes. What if electrodes could be attached to an assembly line, or to the fill heads of a bottling process? Doing so would allow manufacturers to assess machine health, know when it is "sick" and prevent potentially expensive problems. This technology is available for manufacturers today, and it is called statistical process control (SPC). This is the initial control chart made during study one, which assessed weight for the 4-ounce substrates. Every 15 minutes a single substrate was weighed by operators. The last day's weight data is shown here. Source: InfinityQS International Inc.
SPC is a data-driven methodology for analysis and improvement that quality professionals have been using since the early 1900s. This scientific method of analysis involves graphing important characteristics to determine trends that indicate potential quality issues. In the past 20 years, manufacturers have implemented automated SPC systems so they can quickly and easily control product and process quality on the shop floor. SPC's prime objective is to provide information about manufacturing processes in real time. 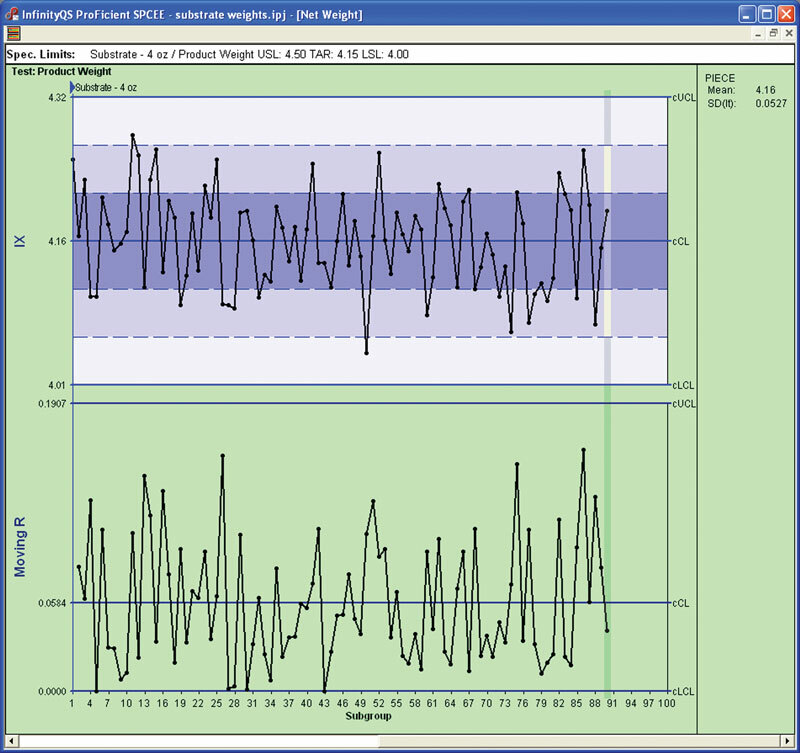 Quality features and data values are plotted in time series on a chart. Like an EKG's printout, the result is a simple, visual graph that provides crucial information to an operator. With a better understanding of their production processes, operators are able to make fact-based decisions to control their machines. Ultimately, this powerful, real-time information allows better control of processes, prevents off-quality product from being produced and reduces overall costs. At the heart of SPC technology is a graph called a control chart. Control charts are used by operators on the shop floor to help identify when corrective actions are required. Control limits, or decision limits, clearly indicate when corrective action is needed and, conversely, when it is not. Control limits should not be confused with specification limits. Specification limits define a window of acceptability based on customer needs or engineering requirements and are an indicator of whether a product is good or bad. A high-tech electronics manufacturer makes substrates for use in military applications. A new production line has just been installed for manufacturing 4-ounce substrates. Because of the extremely high cost of the materials used in the substrate, the company wishes to carefully control substrate weight. If the product is too light, less than 4 ounces, the electrical properties of the substrate could adversely affect component performance, leading to failures in the field-a very expensive, time-consuming problem. If the substrate is too heavy, the material "giveaway" will cost the company more money than necessary. The financial risk of a substrate being too light is greater than that of it being too heavy, but both pose financial risks to the manufacturer. This second control chart made during study two shows the improved weights after process controls were instituted.Source: InfinityQS International Inc.
Every 15 minutes, a single substrate is weighed by operators. 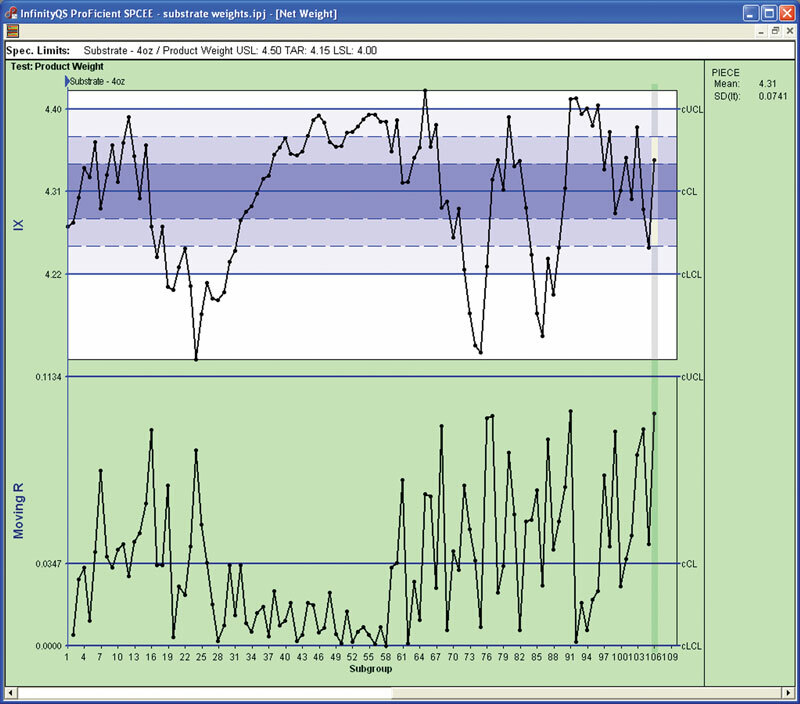 Control charts typically comprise two different charts. The top chart shows the individual weights through time. The bottom chart is called a moving range chart. This chart plots the raw deviations between any two weights, thereby revealing weight variation. The moving range chart shows much less variation in weights between subgroups 26 and 58. Weights naturally cycle from high to low several times during the day. There is a slow, gradual trend in weights between subgroups 25 and 60. The overall average (mean) weight is 4.31 ounces. Because the expected weight is 4 ounces, on average, nearly one-third of an ounce per substrate is "given away" in the study. The control chart patterns-cycles, trends, for example-helped the implementation team better understand start up, warm up and other issues affecting the manufacturing process. After speaking with operators, engineers and hardware vendors, the team made machinery modifications and integrated procedural changes aimed at minimizing weight fluctuation and variation. No clear patterns or trends are present. No weights fall outside control limits. The lack of patterns, trends and points outside control limits indicates that no statistically significant changes in weights have occurred in the second study. The overall mean has been reduced to 4.16, a savings of 0.15 ounce per substrate. The variability in weights has been greatly reduced compared to the first study. The second control chart made during study two indicates dramatically improved process control. In addition, because thousands of substrates are made each week, overall manufacturing and material costs are significantly reduced. Controlling manufacturing processes is tough work, particularly when data analysis tools are unavailable. However, SPC was specifically designed to help companies control processes with simple, graphical methods of analysis. Like an EKG for manufacturing, SPC softwarecan help identify problems, suggest corrective actions and reduce overall costs while preventing potentially serious issues. Douglas C. Fair is vice president of statistical applications for InfinityQS International Inc. (Chantilly, VA), the leaders in SPC Softwaredevelopment. For more information, call (703) 961-0200, e-mail sales@infinityqs.com or visit www.infinityqs.com.